Kitchen Countertops Quartz Countertops What Is So Special About Quartz Countertops? Quartz countertops come in a plethora of designs and colors and if you are wondering why you should go for a quartz countertop when granite is standard in modern kitchens and also costs the same, here are the main reasons why you should consider having a quartz countertop in your kitchen. The first reason that comes to mind is that quartz countertops are scorch and scratch resistant – actually, their surface ranks No. 7 (Mohs hardness scale). Granite is not among the 3 other minerals that are harder than quartz – diamonds, topaz and sapphires are the only minerals that are harder than quartz and this makes every quartz countertop extremely difficult to chip or scratch. Another important advantage brought by quartz countertops is that their surface is almost stain-proof due to the fact that it’s nonporous. For instance, olive oil, cabernet and even coffee can sit on top of your quartz countertop instead of being soaked in thus being ready for your sponge. Because the quartz surface is not porous, you will not have to treat or seal it on a regular basis. For instance, many kitchen countertops like limestone, marble and granite will require regular sealing in order to keep their initial shine. Keep in mind that quartz countertops are ready to be used being maintenance-free. 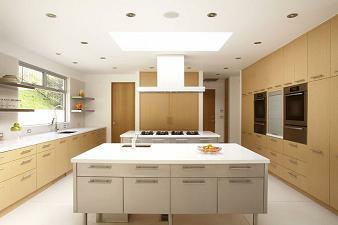 The nonporous nature of the quartz countertops is what makes it difficult for mildew, mold and bacteria to grow. So, quartz is definitely a wise choice both for your bathroom and kitchen. However, this amazing clean factor is not likely to end here. For instance, Silestone quartz comes with the so-called Microban – a trademarked antimicrobial substance that is built right into the surface of these quartz countertops and is mixed with resin goop and quartz. Microban can help to fight the constant buildup of all the tiny pathogenic microorganisms like mold and bacteria. However, you should know that this special antimicrobial substance isn’t likely to protect you from any food-borne illness just by itself – so, you will have to clean your quartz countertop on a daily basis even if Microban provides extra measures of protection. Besides durability, lack of maintenance and cleanliness, you should consider one more reason why you should invest in a quartz countertop for your kitchen – this surface is green. The main concern was with Radon, an odorless and colorless gas that can be found in numerous levels all over our planet. For instance, many manufactured kitchen countertops like the ones made from granite emit small levels of this gas but quartz countertops have already been tested and they have shown little to no such radon emissions.